This commercial grade round picnic table is perfect for gathering friends together for relaxing and enjoying the outdoors. Perforated table top and seats allows rain water to filter through ensuring that the surfaces dry up quickly after the rain. 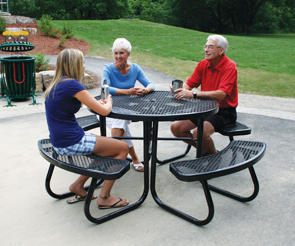 This round picnic table provides seating for up to eight people. Umbrella ready with x-bracing and plenty of room under the table for an umbrella base. Stainless steel hardware included.